I'm happy to say that I'm doing this review specifically because it was requested by reader like you. So, thanks for your input! The only problem is, you guys & gals only asked that I test the New Bright Mud Slinger. None of you were more specific. As it turns out, the Mud Slinger is actually a whole series of RCs in 5 different sizes ranging from modest 1/15th scale to enormous 1/6th scale. I decided to pick two of the most common ones. This 1/10th scale was purchased at Toys R Us. Also check out my separate review of the 1/14th scale New Bright Mud Slinger that I got from Target. The Mud Slingers aren't anything special as RCs go in general. None of them have digital proportional steering. None of them have great suspension or high-traction tires. They're just your basic, bread-and-butter off-road trucks, with some dirt-colored paint splattered on the bodies and tires. The 1/10th scale version I got happened to come with a Hummer H3 body. It's also available as a Jeep Wrangler or Land Rover LR3 -- all the same thing underneath, just different bodies bolted on top. It's about 18 inches long and includes a rechargable battery pack and AA's for the controller. It has bright yellow shocks & springs on all 4 corners, but the front ones are just for looks -- there's no suspension at all! Only the rear has any movement to it. It was also easy to see that this truck is not at all waterproofed, so you shouldn't try to sling any real mud with it. I was definitely let down by the speed and power (or lack thereof) of the 1/10th scale Mud Slinger. It really was not exciting to drive at all. Acceleration is lazy, and the top speed even on flat ground is unimpressive. For a vehicle with such rough & tumble off-road styling, I hoped for more exciting performance. Driving over dirt with some gravel in it put a damper on what was already lackluster performance. With the oversized tires, though, it can get over moderately rough terrain, it just does it very slowly, and you don't want to drive on too much of an incline if the surface is uneven. The rear springs are actually moderately soft, so the ride isn't too bouncy, though having no suspension in the front definitely makes the ride less smooth over bumps than it could have been. The steering is about average at best. It responds quickly, but the turning radius is sometimes wide if the front tires don't get good grip because they're bouncing off the ground too much. 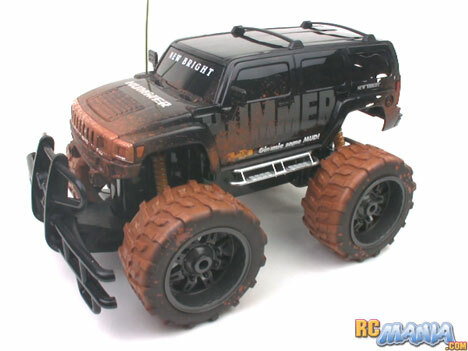 The 1/10th scale New Bright Mud Slinger does run, it does go off-road, it looks cool, and it comes with all of the batteries needed to drive. It just doesn't deliver a whole lot of fun, especially for its cost. I'd like to see the price come down to $40 US or less. Then at least it would be a competitively priced deal for basic all-terrain RC'ing. As it is, it's just very "bleh" to this reviewer.